Health care risk management is a term used for the organization’s culture, processes, and structures that are directed toward identifying and managing its various risks. 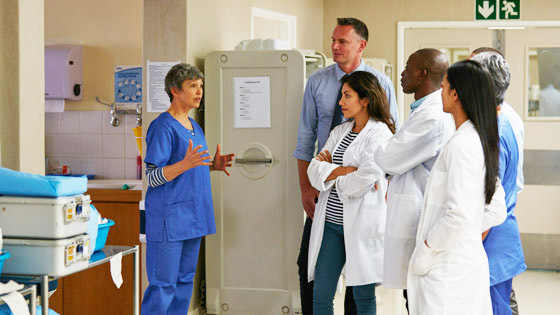 With patient safety initiatives at the forefront of care, the goal of this program is to help health care professionals to develop the background knowledge and skills necessary for the specialty of risk management. Faculty will prepare students to respond to potential risk while developing methods to mitigate loss throughout the organization. The Health Care Risk Management course is comprised of five modules addressing key areas of the field. The program begins with an overview of risk management in the health care setting, exploring the role of risk manager. Legal and regulatory issues are covered, including a thorough examination of the role of documentation and patient records. Enterprise risk management, methodologies, state and federal regulations, corporate compliance, and laws also will be discussed. The program will also address risk issues in non-health-care settings, as well as risk financing, insurance, and contracts. This program aligns with content relevant for the Certified Professional in Healthcare Risk Management (CPHRM) exam, which is administered by the American Hospital Association (see below for details). The American Society of Healthcare Risk Management (ASHRM) is a member of AHA. This 10-week course is offered 100% online in a self-paced format with some scheduled assignments. The field of health care risk management has grown dramatically over the past few decades, leading professionals to new and exciting roles and responsibilities. This program consists of five online modules. All must be completed to successfully complete the program. Introduces the concepts of health care risk management, including the role/scope of a risk manager and a risk management plan. This module will focus on identifying both real and potential risk exposures in a health-care setting and teach risk management tools to help minimize, avoid, and/or mitigate these exposures by implementing loss prevention and loss control techniques. Additionally, this module will explore and present patient rights issues that give rise to common risk management concerns, such as informed consent, advance directives, patient confidentiality/HIPAA, and communication/health-care literacy. Examines the issues surrounding documentation within the medical record. This module will review the fundamental principles and pitfalls of medical charting, as well as the various uses for the medical record. The student will explore multiple liability issues surrounding documentation related to falls, wound care, pain management, medication errors, and changes in the patient’s condition. Safety reporting, “never events,” and “sentinel events” will be discussed. Strategies for incident analysis and prevention will be reviewed. The module will also outline the role of the Joint Commission and National Patient Safety Goals, and the requirements for compliance with each safety goal. Legislation governing patient safety also will be addressed. Introduces the structured analytical process of enterprise risk management (ERM). This module explores the ERM and health-care concepts that holistically support the framework necessary for enterprise-wide solutions and strategies for dealing with organizational risks. We will examine corporate compliance standards and procedures, including standards of conduct, laws, regulations, and government agencies. This module addresses employment-related exposures in health-care organizations, including employment regulations, workplace safety, and organizational staffing issues. We will also examine risk management issues in non-hospital settings, including assisted living, long-term care, home health care, emergency services, ancillary services, behavioral health, clinical research, and telemedicine settings. Examination of risk financing in a health-care setting. The techniques of risk retention and risk transfer will be explored. Types of insurance coverage, how to purchase insurance, and how to read an insurance policy also are discussed. Proficient computer skills as well as strong verbal and written communication skills are required. The following textbook is optional. This program is aligned with content relevant for the Certified Professional in Healthcare Risk Management (CPHRM) exam, which is administered by the American Hospital Association. Candidates meeting the CPHRM eligibility requirements fully and passing the CPHRM Examination attain the CPHRM designation. The American Hospital Association Certification Center (AHA-CC) reserves the right but is not obligated to verify the accuracy of eligibility information supplied by or on behalf of a candidate. Associate degree or equivalent from an accredited college plus seven (7) years of experience in a healthcare setting or with a provider of services to the healthcare industry. 3,000 hours or 50 percent of full time job duties within the last three years dedicated to healthcare risk management in a healthcare setting or with a provider of services (e.g. consultant, broker, or attorney) to the healthcare industry. “The program has better prepared me to take the certification exam for my CPHRM." Linda J. Ramsey, Esquire, ARM, CPHRM has over 20 years of experience in Risk, Claims and Insurance Management, Patient and Employee Safety, and Quality Review in a not for profit health system. With 5 member hospitals ranging in size from 33 beds to 450 beds, a total at one point of 1200 licensed beds, Linda’s position evolved based on her skill set. Linda has managed a budget of >$30,000,000 and 12 FTEs. She is an insightful, detail oriented and adaptable risk management professional who thrives on developing efficient solutions to complex problems that cross disciplines and entities. She has extensive knowledge of state and federal regulations governing healthcare, TJC, and developing practical recommendations that can be implemented to achieve desired outcomes. She is currently working as an interim risk executive assisting facilities in the U.S.